Discussion in 'UFC Discussion' started by logan rj, May 28, 2014. The passage of Jon Jones by Brazil may have rendered the light heavyweight champion of the UFC more than just visibility in the country. In an interview during his presence at the headquarters of the Social Football project, which brings together young people "at risk" and form teams to compete in the Homeless World Cup, as part of the promotion of TUF Brazil 3 Final, "Bones" has revealed that appointment with Vitor Belfort in the U.S., and that the Brazilian can become part of your team, the Jackson's MMA in the future. - I will not stay for the fights on Saturday. In fact, I plan to train with Vitor Belfort on Friday in Miami. I'll find him a home gym, we train together, we will see if we have any chemistry and perhaps we may become training partners in the future. I do not know (if he goes to Jackson's MMA). He called me, came to me, said he wanted to train with me. ... Maybe we train together in the future. I thought that was Vitor till I scrolled down lol. that's some funky translation but if what I got (Vitor asked to crosstrain with Jon Jones to which Jones accepted), that is awesome. War Vitor "The Lion from the Past into the Future" Belfort. Isn't one of the knocks on Vitor that he isn't a loyal training partner? He goes all over. I thought Anderson Silva's problems with Vitor stemmed from the fact Vitor wanted to fight, even though they had trained together and were friends. He's training with killers like Rashad but makes sense he would want to go train with the GOAT. The passage of Jon Jones by Brazil may have rendered the heavyweight champion of the UFC more than just visibility in the country. In an interview during his presence at the headquarters of the Social Football project, which brings together young people "at risk" and form teams to compete in the Homeless World Cup, as part of the promotion of TUF Brazil 3 Final, "Bones" has revealed that appointment with Vitor Belfort in the U.S., and that the Brazilian can become part of your team, the Jackson's MMA in the future. It's correct in the portuguese version. Doesn't seem like it would be much of an issue here. I don't think anyone foresees a call for Jones/Belfort 2 in the near or distant future. Anderson Silva almost murdered his coach. I don't think he has grounds for being upset about something so trivial. At first glance i thought that was Vitor in the chair, TRT is nasty. 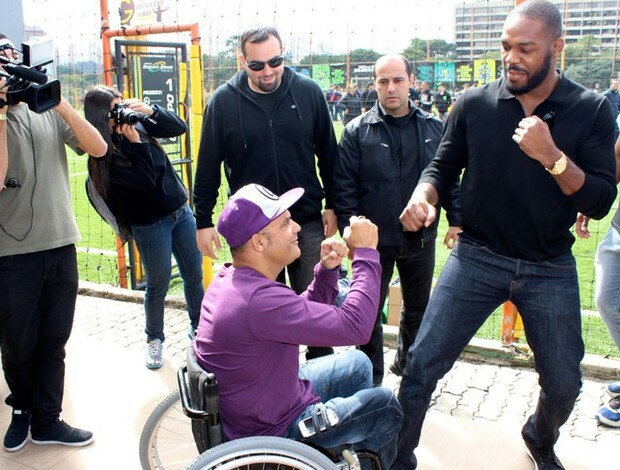 I knew that TRT-ban took a lot out of vitor but I didn't think it was so bad that he had to sit in a wheelchair.